Daniel Alves Da Silva is a Brazilian professional football player who plays as defender in Spanish club FC Barcelona and Brazilian national teaml as well. Alves is also known as "Canarinha". Born in Juazeiro, a city of Brazilian state of Bahia. He was son of a farmer Domingos Alves Da Silva who himself have passion for football. When Alves was young he used to help his father in his farm work. Beside playing football Daniel Alves is involved in charity work too, He has worked with a lot of diverse charities, some of the honorable mentions are Special Olympics, Barcelona Magic Line, Signed T-shirts for charity, Daniel Alves, against Cancer. Barcelona's Dani Alves was married to Dina Alves but later they divorced in 2011 after 3 years of their married life. Alves has two children from his ex wife Dina Alves. Daniel Alves was named as a global ambassador of football for the Special Olympics. 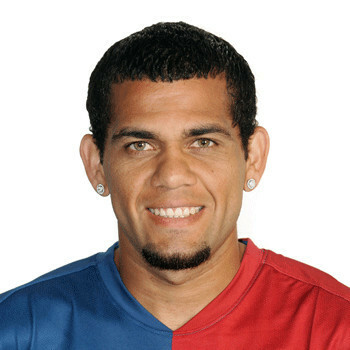 In 2005/06 Daniel Alves was UEFA Cup Most Valuable Player and in 2006 he was UEFA Super Cup Most Valuable Player. Since Dani Alves would be available on a free transfer from Barcelona in the summer,there is lot of rumours if FC Barcelona's defender Daiel Alves will transfer to Manchester United or Livepool. A heroic and an iconic athlete, Derek Fisher is a retired basketball player who is now pursuing his career as a basketball coach. Darren Daye was an American professional basketball player. He is retired now. He played as small forward and shooting guard for Chicago Bulls, Bullets, Mens Sana Siena, Pau-Orthez and Boston Celtics. An American professional football player who plays under the National Football League. Currently he is playing as the wide receiver on the team Seattle Seahawks .